The tone of this presidential election, often called “uncivil,” has led many to call for an urgent improvement of civic education in America. Civic education can teach citizens how to deliberate, even when they have political differences. It can enable citizens to find solutions to many problems such as school attendance, economic development or community safety. For over a decade, we’ve worked as researchers investigating a wide range of questions related to youth civic participation. Over this period, we have observed how civic life has been transformed. New technologies emerged as well as new political and social movements, such as the Tea Party, Occupy Wall Street and the movement for black lives – all of which have changed civic life. Indeed, today’s youth have a lot more opportunities to express their political views and take action through online platforms. However, significant gaps remain in one of the most basic forms of civic participation – voter turnout. Only about 40-45 percent of 18-to-29-year-olds turned out to vote in the 2012 election, and gaps among youth remain a concern in 2016. One big reason for these voting rates is in the way many public K-12 schools are teaching civics: Students may be learning about the mechanics of government, but they are not always required to learn the skills needed for civic participation. Teachers, meanwhile, have voiced concern that lessons about elections and politics will be perceived by some as partisan. Currently, there are dramatic gaps among youth when it comes to voter turnout. The young people who regularly vote look like the youth population as a whole because youth do not vote at the same rates. Our analysis of state and federal voting data shows that young people without college experience remain underrepresented. For example, in the 2012 election, 56 percent of youth with any college experience voted compared to only 29 percent of youth with no college experience. These young people between 18 and 29 make up 40 percent of the youth population. The gap was just as large in the high turnout election of 2008, where 62 percent of youth with any college experience voted, compared to only 36 percent of youth with no college experience. Our analysis of census data suggests this trend is not new and this gap has existed for decades. Why is civic participation of youth so low? 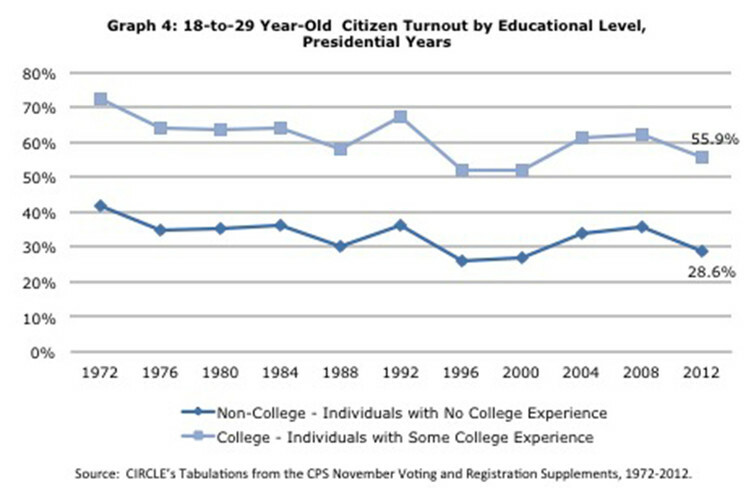 Civic education can not only increase youth voting, but in doing so also begin to close historic voting gaps. Our research shows, however, civic education itself remains a neglected area in in American schools. Most states do not consider civic education as a vital part of student learning. While social studies is part of the curriculum in most states, reports from 2013 show only eight states assess students’ civic performance. 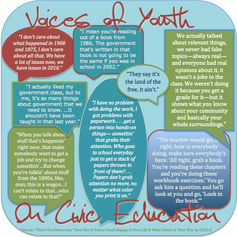 Comments from young people who participated in a CIRCLE project reflecting on their high school experiences. The curriculum itself leaves much to be desired. Too often, in public schools, civic education is reduced to learning history and dry information about governmental processes. Students learn significantly more historical information – for instance, about wars and individual people – than skills that can teach them how to solve problems. Research into state social studies curriculum standards shows they often do not include learning in detail about modern parties and their ideologies. The results differ by state, but the general trends are striking. For example, this research indicates that “Democrat” and “Republican” are not often found in school curricula and only 10 states ask that students learn what these parties stand for. It’s difficult to understand how a young person would understand American politics without this ability to differentiate. In addition, schools don’t help students connect their learning to practice. It is students in wealthier schools, or who are on a “college track,” who are more likely to find opportunities to learn about civic engagement through discussions or hands-on research that allows them to work on finding solutions to civic problems that they care about. For example, a group of high school students in Chicago, after learning how to make their voices heard on civic issues, campaigned to have bus stop benches along major bus routes. Students in a civics class in a rural farm town of Yuma in eastern Colorado. Another big challenge when it comes to civic education is public resistance to teaching anything remotely connected to electoral politics in public schools. In a less controversial election (2012), teachers told us they believed that they would receive a pushback if they taught about politics and elections. In a national survey of over 700 teachers we conducted during the spring after the 2012 election, more than one in four current teachers of US government or civics said that they would expect criticism from parents or other adults if they taught the election that had taken place that fall. Only one-third (38 percent) said they would get strong support from their district. Concerns about introducing elections to classrooms are misplaced, since research has not found patterns of teachers influencing students’ preferences in elections. We found in 2012 that taking civics didn’t correlate with either partisanship or vote choice. Existing research demonstrates that engaging youth in elections before they reach the age of 18 can increase the likelihood of voting. Classroom teaching practices where young people learn about current issues or can practice having conversations with different viewpoints involved can start to close these gaps. These more active teaching practices allow youth to increase knowledge and develop skills, such as how to communicate effectively with someone with differing views. In turn, this can also build a young person’s confidence in their own ability to participate. Knowledge alone is not enough to ensure future civic engagement. Our research shows that classroom teaching practices were positively related to informed voting, the idea of voting with accurate knowledge about the democratic system and preferred candidates. Additionally, preregistration laws, which allow 16- and 17-year-olds to preregister and then automatically join the voter rolls when they turn 18, boost turnout. Appearance on a list of registered voters means that these preregistered youth are more likely to be contacted by parties and interest groups that use lists of registered voters for outreach. As a result, easing youth into civic participation, through preregistration and starting to experience structured civic participation in the classroom, can prove valuable to later engagement, like voting. Voting is habit-forming. Closing gaps early by strengthening the connection between school civic education and civic participation could ensure that our electorate will more fully represent the U.S. population.